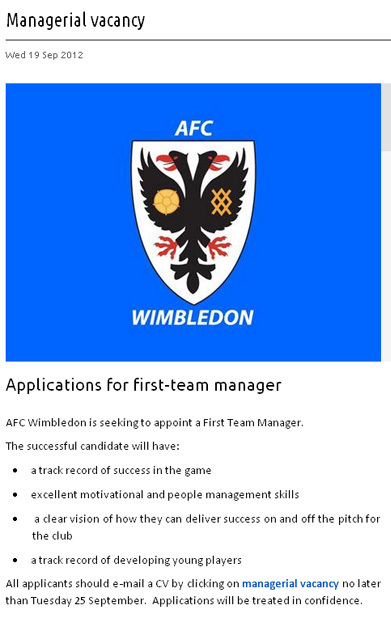 Just hours after showing Terry Brown the door, AFC Wimbledon were openly advertising for a new manager, on their website of all places. Rather than go through the usual channels, the League Two strugglers have decided to open the door for anyone and everyone to apply for the job. Fancy a shot? Surely it’s worth a try? Just printing out my CV and supporting material starting from Championship Manager 98-99 through to the current day. I wonder will they accept success in FM…. Hopefully my Fifa resume is enough. I guided Notts county to champions league glory in 4 years. Wish me luck. I hope my fifa resume is enough. I guided notts county from league 2 contenders to european champions in 4 seasons. Worth a shot, we could create a nifty table that translates the value of trophies won on FM to real world eg. There’s an awful lot of the same joke going on in here.